Every Friday, thedeck gets down. 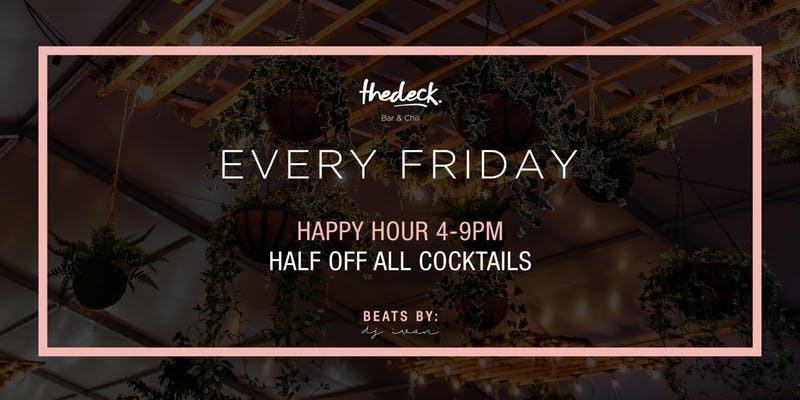 Bring your crew for the Wynwood Happy Hour of your dreams and sip on all drinks for 50% off, in the neighborhood's hippest spot. Keep the vibe alive with beats by deejay Ivan, cabana hangs and a scenic venue that'll have you partying into the weekend. Hunrgy? Get a taste of your fave Food Truck bites at the Wynwood Market Place's "Eat Around the World", where you experience signautre treats from Wynwood food trucks, showcasing the very best of international snacking. Bar & chill with us. Only at thedeck.